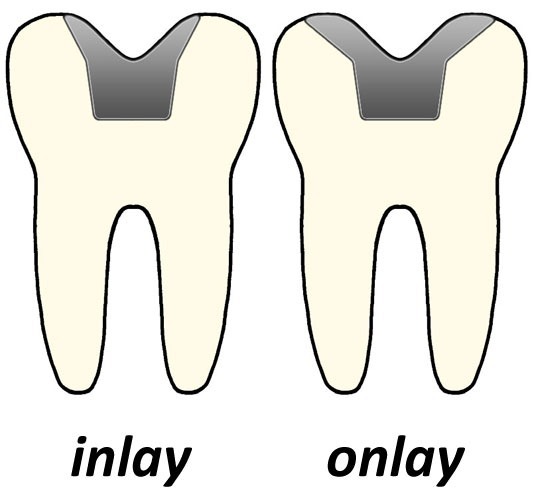 If you’re unfamiliar with the terms “inlay” and “onlay” you’re not alone. “Indirect fillings,” as they’re sometimes called, offer a conservative method for repairing tooth decay. They are especially appropriate when a tooth is too damaged for a traditional filling, yet not damaged enough to warrant a crown. Dental inlay and dental onlay restorations are safe, strong, long lasting, esthetic, and functional. Best of all, they preserve a tooth’s natural structure. So what are they exactly? Read on to find out! A dental inlay is quite similar to a filling, but is much more customized and permanent. It’s housed entirely within the cusps (ridges) of the tooth and restores the area, which was damaged by decay. Inlays are custom made in a lab (using an impression of the tooth) and are later cemented into place, adhering to the tooth through a process of bonding. An added benefit of inlays is that they can last for up to 30 years—far longer than traditional fillings. A dental onlay (sometimes called a “partial crown”) is used when more extensive restorations are required. More specifically, if one or more cusps of the tooth are involved then an onlay may be an option for restoration. This is a great alternative to traditional crowning due to the fact that onlays allow for more of the natural tooth to stay intact; it doesn’t require a reshaping of the tooth itself. Since the materials and the process of bonding is the same as you find with inlays, the longevity of an onlay is equally as impressive. We recommend inlay/onlay restorations for a variety of reasons related to oral health and esthetics. When it comes to a healthy smile, our inlay and onlay restorations make a world of difference to patients who experience tooth fractures, decay, and broken fillings. Inlay/onlay can also be used for cosmetic enhancements by replacing old silver fillings. The result? An incredibly transformed smile that looks completely natural. For more information about inlay/onlay procedures, call our office at (978) 688-4441 or schedule your consultation today. We look forward to helping you attain the healthiest smile possible!